The publisher of "Fire and Fury" has finally caught up to all the demand for the book. Henry Holt, a division of Macmillan, announced Wednesday that it has sold "1.7 million copies across all formats including hardcover, digital and audio books." That's a phenomenal number for any book -- and even more remarkable considering almost no one had heard of "Fire and Fury" until three weeks ago. 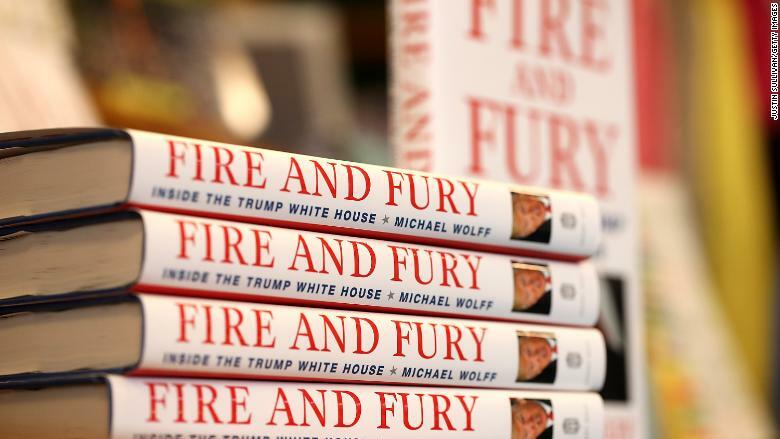 Demand for the book about the chaos in President Trump's White House greatly exceeded supply, and some customers had to wait weeks to snag a hardcover copy. But bookstores are now receiving fresh shipments and sites like Amazon are no longer reporting order delays. Henry Holt said in a press release that "there are now 1.5 million hardcover books in print after 22 printings." The book, by controversial media columnist Michael Wolff, is based on unique access to the White House and explosive interviews with top aides like Steve Bannon. The publisher expected the book to be a hit -- but top executives admitted they were surprised by just how intense the reaction was. While sales at this breakneck pace is impressive, it doesn't come close to the number of copies sold for the final Harry Potter book. "Harry Potter and the Deathly Hallows" moved a staggering 8.3 million copies in the first 24 hours when the book came out in 2007. When an excerpt from the book leaked out on January 3, the book soared to No. 1 on Amazon's best sellers list, and it hasn't budged since. The following week, the book debuted at No. 1 on the New York Times best seller list. One of the president's personal attorneys sent cease and desist letters to the publisher and author, further stoking interest in the contents of the book. Henry Holt moved up the release date by four days, so it has technically been on sale since January 5. While the company scrambled to print more copies, some buyers chose the e-book version instead, and others opted for a wait list. At a book party last week, Henry Holt publisher Stephen Rubin toasted Wolff for "taking on the planet's biggest bully" -- that would be Trump -- and for energizing the book world. "In an era when television and social media dominates the national conversation, it is absolutely thrilling that a book had a profound effect on a presidency and on an entire nation," Rubin said. "It has surely sparked an urgent debate on Trump's fitness for office." Rubin also mentioned that Wolff is under contract for another book with Henry Holt. Wolff is sure to make millions of dollars as a result of the "Fire and Fury" furor. Andrew Wylie, Wolff's literary agent, said he has sold the rights to the book in 35 countries so far. And Endeavor Content is working on pitching a series based on the book to TV networks. In a separate announcement later in the day on Wednesday, Henry Holt said that the editor of Wolff's book, John Sterling, "has decided to step back from full-time work for the company so he can devote most of his time to starting a new career in politics."